The Colt Model 1911 .45 caliber semi-automatic pistol may well be the longest-serving firearm of the industrial age. Its classic lines make it easy to recognize, from the pronounced grip safety above the traditional checked grips to the bore's gaping maw. 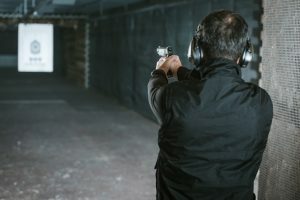 It's been more than a hundred years since the first 1911s were introduced for military trials and their growth in popularity hasn't slowed down much since then. We're going to discuss what makes this pistol great, then talk over some of the best IWB holsters for 1911 pistols and go over the features that make them stand out from the rest. The Colt Model 1911 was built from the ground up for knockdown, drag-out fighting. The knockdown part was of particular importance: while fighting Philippino guerrillas in a conflict eerily reminiscent of our recent struggles in the Middle East, the US Army discovered that its latest service revolver was simply not up to snuff when it came to stopping power. The revolver in question, the Colt M1982 chambered in .38 Long Colt, was a serviceable if average example of its times but developed a reputation as severely underpowered in the face of jihadi fanaticism. The Moro guerrillas of the Philippines had fought Spanish occupation for centuries and were zealously committed to their cause. Known for suddenly bursting from hiding places or crowds with a sword to attack American troops, Moro insurgents supplemented their enthusiasm for close combat with a drug regimen designed to reduce their ability to feel pain. The .38 LC often failed to stop these attacks before it was too late, and the Army paid the price in killed and wounded men. Let's get real, though: We're Americans. If our guns aren't big enough for the job, by God we will build bigger ones and try again. 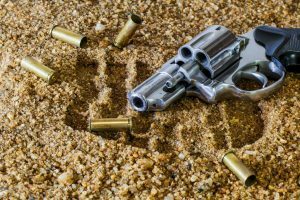 With that principle in mind, the Army set out to find a handgun better suited to stopping highly motivated attackers at close range. Field trials indicated that the enormous new .45 Automatic Colt Pistol cartridge made up for the .38 LC's deficiencies in spades. Remember, guns don't kill people, physics kills people. 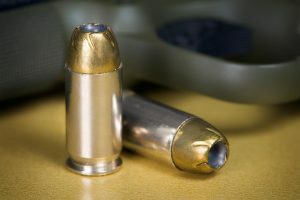 Boasting both a heavier bullet and a higher muzzle velocity than its predecessor, the new .45 ACP round delivered dramatically more energy to the target and as a result was capable of knocking down a running man at several meters' distance without sacrificing accuracy. In fact, the M1911 succeeded so thoroughly against the Moro insurgency's tactics that it was adopted as the Army's sidearm and remained so until it was supplanted in the mid-1980's by the Beretta M92. 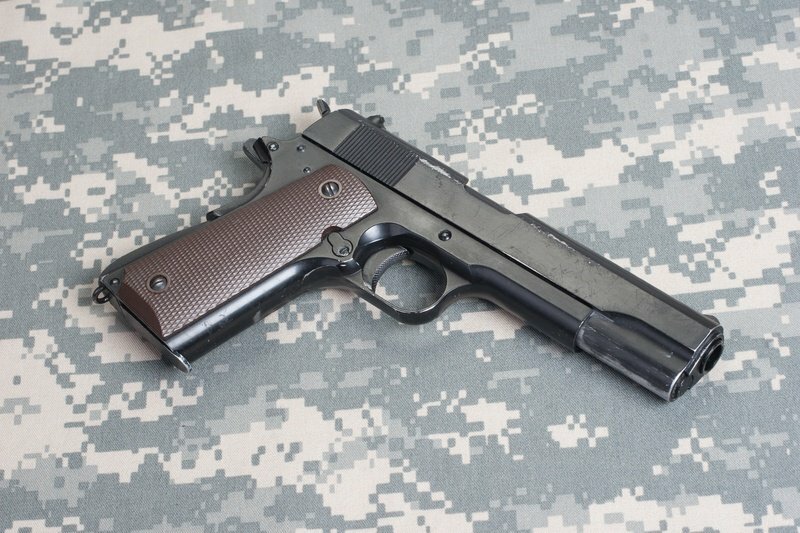 Through two world wars, Korea, Vietnam, and beyond, the M1911 served with our troops overseas and in many a civilian police department. It remains a highly effective carry pistol, known especially for its outstandingly crisp trigger break and bone-crushing power. Whether you're a rank amateur or you rock that piece like Jerry Miculek, we'll help you find the holster that fits your style and comfort level. The third rendition of Alien Gear's Cloak Tuck line has perfected its predecessors' designs and taken them to a new level of reliability and function. This fairly large, open-top IWB holster mounts to a back panel that connects to the wearer's belt using two mounting clips. The holster shell itself is adjustable via mounting screws which connect it to the back panel, so you should be able to find a position that works perfectly for you. Comfort is the watchword here: it's tough to overstate how well this rig will keep your 1911 in place and ready for action. One of our favorite things about Alien Gear's offering is its retention system, a material called AlienSkin. They can call it "thermoplastic polymer" all they want; we know the truth is out there. Jokes aside, the material grips your pistol firmly but provides an impressively smooth draw when the time comes. IWB holsters rely almost exclusively on passive retention systems; if the bad guys are reaching into your pants to get your pistol, you've got more problems than just retention. We think the AlienSkin system is one of the best IWB holsters for 1911 pistols, and we're confident you will as well. On top of all this, Alien Gear Holsters provides a no-strings-attached lifetime warranty for all of their products. Given the price and the pedigree, it's tough to pass on this one. In the interest of full disclosure, some carriers might take issue with the overall width of the Cloak Tuck 3.0. It's a pretty sizable chunk of leather and plastic, albeit cleverly designed to minimize its profile. If you're looking for a slim, minimalistic holster you can wear without a belt, this one is not going to work for you. Your concealed carry pistol can't help you if you're not carrying it, and sometimes we're forced to wear clothes that don't lend themselves very well to a full shell-and-panel arrangement. If you need a holster that's small enough not to draw attention even in light clothing while still keeping your pistol in position and easy to reach the Galco Waistband if right for you..
Galco has been operating for a long time, and their reputation for quality is very tough to beat. The attention to detail they put into their construction is the biggest reason for that longevity. Galco's American-made leather is tough, and the fittings with which they attach their belt clip are top tier. This rugged little piece of kit comes complete with an overhanging retention strap, but can be used without it if you prefer. 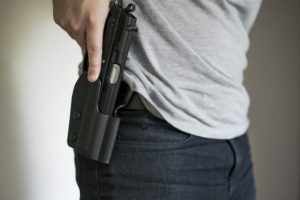 If you carry cocked and locked, it can be a good idea to keep that strap over the top of the hammer, if for no other reason than to prevent perspiration and grit from getting to the moving parts. No holster is perfect, though, and even the topflight Galco designs have their occasional flaws. In the case of the Waistband IWB, the main issue is the single belt clip. 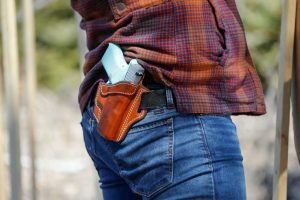 Compared with two-clip systems, this holster tends to shift around a bit more, and because it doesn't attach to a back panel, it won't feel quite as naturally snug as some of the other offerings on this list. That said, if you're looking for extremely high quality in a very compact package, this holster is hard to beat. 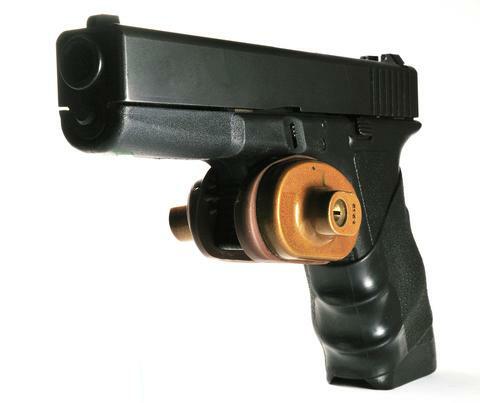 When it comes to small, unobtrusive holsters, Sticky Holsters has practically cornered the market. These things are dead simple: stick your gun in the holster, stick the holster in your waistband, and let the namesake sticky exterior material do the rest. We're still not convinced these things aren't made of voodoo, because despite the lack of clips, locks, straps, or any other attachments, they stay put. The exterior coating isn't "sticky" to the touch, but once it's in your waistband it warms up and locks in against your clothes (or skin, if you prefer.) This allows for secure carry in practically any outfit where you've got a secure place to stick the holster. 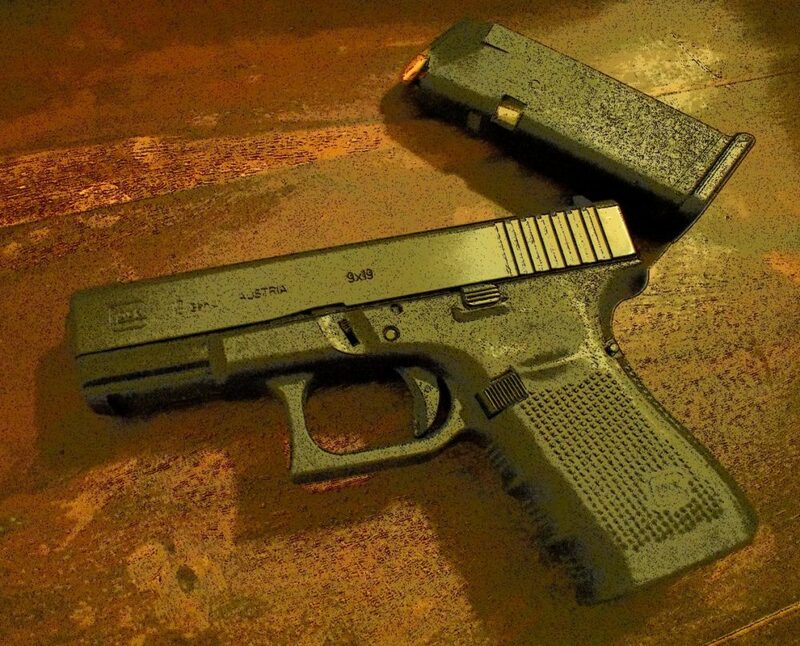 One last major benefit is that these are not pistol-specific: If you carry different but similarly-sized pistols from day to day, the Sticky will work with all of them. Despite the revolutionary design, there are a few downsides here. 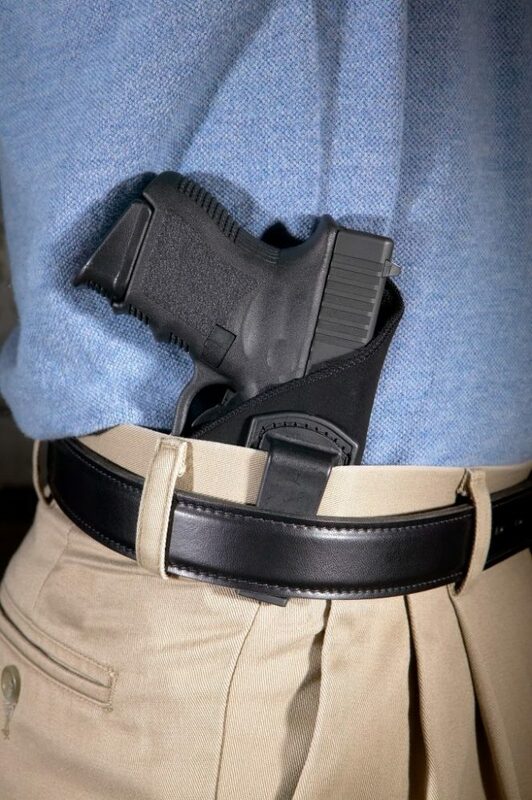 This holster offers very little in terms of retention beyond the pressure of your waistband, so if you're going to be doing armed cartwheels, look elsewhere. Likewise, because it's a solid panel of rubber-like material, these suckers can get a bit warm, which translates to sweaty in practice. Their performance doesn't suffer, but your pistol's finish might. 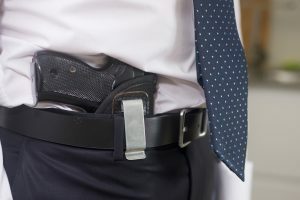 Lastly, it's practically impossible to reholster your gun without removing the holster from your waistband, as it will collapse shut after you draw. All of that means that this holster is designed for a particular type of carry. If you've got a waistband but no belt, or if you need something very small and thin with no visible exterior attachments, this is by far the best option you're going to find. These holsters work best for smaller-model 1911s; we would recommend against them when it comes to full 5" barrels. 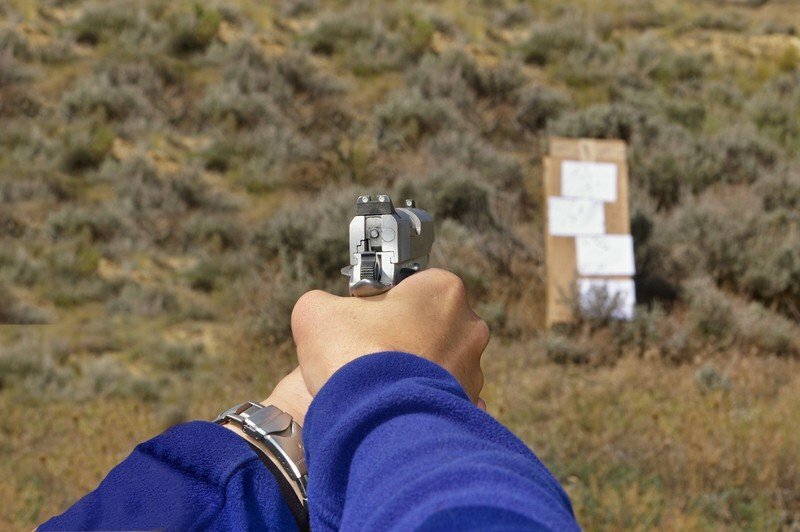 No matter which model you pick, the key to comfortable carry and a smooth draw is practice. Know your weapon, know your gear, and remember: Knowledge may be half the battle, but the other half is drawing quick and shooting straight, every single time.